For centuries Bath has been the place people came to relax. The ancient Romans came here for the hot thermal waters, and the Roman Baths are still a centrepiece of the city. The Victorians came here to take the healing waters and to shop: as a result, Bath today is a mix of ancient culture and refined boutiques, beautiful historic Georgian architecture and elegant eateries. Get the most out of the city with our 1 day itinerary. For short trips like this one, you can book your individual rail tickets in advance through the Trainline . If you’re making a longer journey, one of the easiest and most relaxing ways to explore Britain is with a BritRail Pass that allows you unlimited journeys, giving you the freedom to explore at your own pace. Catch the train from London Paddington to Bath, the journey takes around 1 hour and 25 minutes. For short stays like this, the cheapest tickets are available through The Trainline. One of the most famous images of Bath are those golden stone Georgian terraced houses. There’s the magnificent sweep of them at the Royal Crescent, and also a complete circle at the nearby Circus. Be sure to explore the stylish shopping streets and arcades too! One of best preserved ancient sites in Europe, the Roman Baths are a must-see. Admire the colonnaded pools and immerse yourself into the story of Romans at leisure. The Roman Baths are a 5 minute walk from the train station. Relax like the Romans in the natural thermal waters of Thermae Bath Spa, the modern equivalent of the ancient Roman Baths. Here you can bathe in naturally warm, mineral-rich waters in their rooftop pool overlooking Bath’s city skyline. Thermae is a 5 minute walk from the train station. The Royal Crescent is a sweeping crescent of 30 terraced houses built between 1767 – 1774 and a splendid example of Georgian architecture. No 1 Royal Crescent is a popular museum and No 16 is the Royal Crescent Hotel and Spa. The Jane Austen Centre celebrates one of its most famous residents. It offers a glimpse into the Regency period when Jane Austen lived. Get into the spirit and dress up in one of the many Regency era costumes available at the centre. 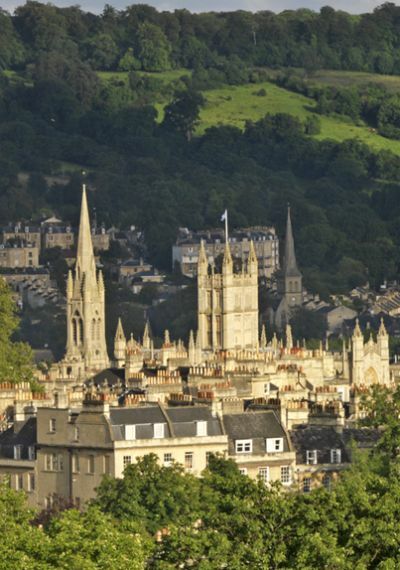 Discover how the city of Bath inspired her writing including much loved novels of Northanger Abbey and Persuasion. This museum is a must see for all those fashionistas and is in the world’s top 10 museums of fashionable dress. The Fashion Museum displays over 400 years of costumes and there is of course an opportunity for you to dress up and be photographed against a Victorian background!